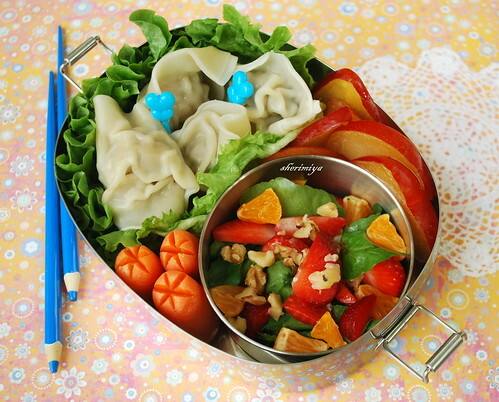 Wontons and Watercress Salad Bento, originally uploaded by sherimiya ♥. I added a watercress salad tossed with fresh chopped strawberries and mandarins, sprinkled with chopped walnuts. I would have added goat or feta cheese too, but I didn't have any. I squeezed some juice into the salad too... and guess what? He said he liked it! Yay! I wasn't sure how the watercress would go over. When I was a kid it took awhile for me to get used to the taste. It's also good in soup. Some baby star-cut carrots got placed in the corner, and I managed to slip some plum slices in as well. These are raspberry jewel plums, which are teardrop shaped and supersweet and juicy. They are a lovely rosy magenta color, so pretty. I was excited to see them in my local grocery this week, for a nice addition to the fruit section. Just wait till the full summer crop! The salad sounds very interesting and howabout your boy eating watercress!!! I hated it during "small kid time". Good for Misterman! I could eat wonton all day long and those look luscious! Stunning colors. The wontons look so delicious. wow, your wontons look absolutely beautiful, and i must say i admire how you've kept the box so lively and colorful. whenever i make mandoo or other dumplings, i have the best intentions of using them in bento, but then i find everything looks beige. i'll take some pointers from this one! Homemade wontons ftw! Combined with fresh, peppery watercress, this is just wonderful!! Really loving the bright light blue accents, which make me think of a peerless May morning, or robin's eggs...delightful bento! javapot, thanks! 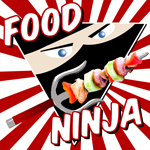 Wontons are fun to eat, that's why! Debra, I always remember passing by the watercress farm and wondering why in the world anyone would farm that stuff! Thanks a lot! Thanks Ceinwyn! Hope you can try the salad and wontons. bentobird, your comments are always so poetic, I can't believe you've written about my lowly bento! Thank you dearly! Beautiful! I wish I had had something like this to take to school when I was a kid. Thanks a lot for the nice comment Nicole!